The Italian design house Etro released Shaal Nur in 1997. It is said to be named after an Indian princess, and there is also an Etro scarf design by the same name. The fragrance has notes of citrus, rose, narcissus, karo karoundé, jonquil, incense, vanilla, and spices. Shaal Nur starts with a burst of bright lemon and dry incense. The floral notes, with the rose most prominent, come on shortly thereafter but remain in the background; the incense is the star of the show here. It is lightly spicy, and said to have both coriander and rosemary. The vanilla is very muted but does provide a touch of sweetness to counterbalance the otherwise dusty incense and spice notes. 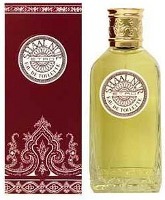 I adore incense fragrances, and Shaal Nur is one of my favorites. It is unusually light and airy (and cheerful) for an incense scent, and very different in character from Etro’s other incense fragrance, Messe de Minuit. Of the two, I would say Shaal Nur is the more easily wearable. Messe de Minuit is a more gothic, moody scent, and perhaps makes more of a statement, but I have to be in a particular frame of mind or I find it overly oppressive and melancholy. Shaal Nur is classified as a unisex scent, and can be worn in any season. It is only available as an Eau de Toilette, so as expected the lasting power is less than fabulous. I must add that I love the old-fashioned Etro bottles and labels, and if you can snag a bottle at perfumebay, the price is not too bad. Etro Shaal Nur is available in 100 ml Eau de Toilette and in matching body products. For buying information, see the listing for Etro under Perfume Houses. Hello R! I got a bottle soon after this was launched. Nice and as you say can be worn throughout the year. If I remember right (as I do with many of my bottles) gave it away to a friend who loved it more than I did. I *adore* Shaal Nur! This is a fragrance I almost feel willing to bow down before! It must be the incense in it. Glad we have at least one scent love in common, M! I just tried this one for the third time today and am once again amazed at how differently it smells on skin than out of the bottle (I know, I'm a newbie to the perfume world and still easily amazed :). I'm really not getting much citrus on my skin, just some floral, plenty of vanilla, and what I assume is the incense. (Like I said, I haven't smelled enough to know.) It smells a little bit like the powder my mom wore occassionally, Vanilla Musk, I think. I also found that, though I liked it all three times I wore it, the second time it was almost overwhelming even though it seems to stay pretty close to the skin on me. I think I have to be in the right mood- it's hit and miss. Very nice though. I seem to have gotten a pretty decent set of samples this time around. Glad you are enjoying your samples! Any must-buys so far? Maybe not a must-by yet, but I think my favorite has been POTL Passage D'Enfer- it reminds me of Easter or Christmas b/c it smells like beeswax and apple to me. Lubin Idole was very nice to, although it only suits me at certain times. It smelled kind of…piney, maybe? It's been a while since I tried it. Of course, this is coming from someone who, a few months ago, would have described anything not fruity-floral as too old for me. I love both POTL & Passage d'Enfer — good choices! Shaal Nur is one of my all time favorites, especially since it allows me to wear an incense scent during summer. The citrus and florals keep it from being overwhelming and the incense keeps it interesting. I love Passage d'Enfer and bought it, but it doesn't last on me – alas! Timbuktu, on the other hand, lasts nearly 24 hours! Shaal Nur, by the way, lasts all day and often I can still pick up a hint in the morning. Shaal Nur really is the perfect summer incense, and I agree — I can smell it the next day too. I am very new to all of this as well. I recently purchased Sarah Jessica Parker's “Lovely”. Although it is lovely, it is still not quite “my” scent. I have been reading many descriptions on here for months, but still am having a tough time finding something to fit me. Right now the two that look the most interesting are Etro's Sandalo and Shaal Nur. Can someone please break down the differences? I love anything that is more incense smelling, but not overpowering. I love some sandalwood, grassy scents yet still feminine. I was interested in Aveda's Yatra, but has no lasting power on me. Thanks for any help!!! Shaal Nur is a floral incense, Sandalo is a creamy, slightly sweet sandalwood. Have you considered ordering samples? I would love to do that. Where could I find them? Is Shaal Nur somewhat herbal as well or simply floral? Thank you?! You can order samples from Aedes.com. It is not strongly herbal to me at all — mostly flowers & incense. The opening notes of Shall Nur are exquisite, and almost caused me to buy a bottle there and then. I was really disappointed with the ending, but loved the beginning enough that I ALMOST sprung for the €90.00 purchase price. And in the mean time I will continue to love and adore Messe de Minuit! Good thing you waited! And that's expensive. I got my bottle very cheaply at discount, although at the moment the cheapest price I'm seeing online (in the US, so not much help) is $70. I bought a bottle of this (3.3 ounce eau de toilette) at Filene's Basement for about $48. Quite a bargain, I thought. But the bottle looks different from the one pictured here, and the one I've seen elsewhere on line (on the Aedes de Venustas site, and on Etro's own website). It's the same shape but has a bumpy, raised, sort of paisley patterned surface all over. What gives? Is this a counterfeit? Or some kind of off-price line? It smells like the real thing…. Oh, lucky you — that was a limited edition special bottle, IIRC. Great price, too!